This traditional hotel is in Central London, a short stroll to Earls Court Exhibition Centre. This affordable hotel is a brief taxi trip from the busy centre of London. Those staying at the Boka Hotel have access to a number of facilities, including family rooms, free wireless internet access in public areas and a 24 hour reception. It offers a tour desk, luggage storage and a concierge. All of the well-equipped rooms at the Boka Hotel feature a hair dryer, tea and coffee making facilities and a refrigerator. Each is equipped with a TV, heating and a private bathroom. Travellers can wake up to an English breakfast served each morning at the Boka Hotel London before venturing out to explore the surrounding region. 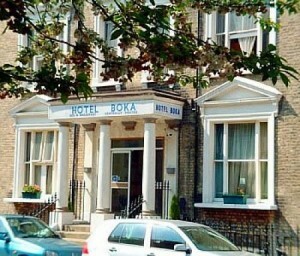 The Hotel Boka is a short walk from Chelsea F.C. and Stamford Bridge. Brompton Cemetery is also situated a short walk away.